Standard histories of technology give tired accounts of the usual inventions, inventors, and dates, framing technology as the inevitable march of progress. They split history into ages - electrification, motorisation, and computerisation - and rarely ask whether anyone bothered to use these inventions at the time. Shock of the Old is not one of those histories. I Letters exist alongside emails and outlasted telegrams; we still make physical books and magazines despite the rise of the Internet - a belated rise considering that the technologies that made it possible was invented in 1965, and bookshops thrive despite Amazon. More horses were used in the Second World War than any other war in history and propeller planes continue to take off from the same runways as jets. Shock of the Old forces us to reassess the significance of old inventions such as corrugated iron and sewing machines and rethink the relative importance we place on the invention of something new, its application, and its widespread adoption. 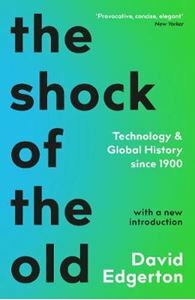 It challenges the idea that we live in an era of ever increasing change and, interweaving political, economic and cultural history, teaches us to think critically about technology.